Do you see what I see? I'm sure you do, but I'm hoping that when they are dry and I wear them on our holiday this weekend, no one else will notice because I don't have the time to reknit one of them before we go. I might have enough yarn left to knit a third one so I will have a matching pair (nothing better than a 'pair and a spare' even if the spare is a little bit different!). I would blame knitting in the dark, but I can't. I made the first one in broad daylight before writing a chart, and then drew the chart and knitted from that for the second one, but obviously the chart and the first one didn't match - grrrrr! So I'll type up the pattern for a MATCHING pair, and will post it here when we get back. If you fancy making some which are the same, you'll need three different shades of Scheepjes Merino Soft* - I used one ball each of 613, 635 and 610. This is the same yarn which is in the 'Luxury Kit' for the Last Dance on the Beach crochet-along - you can find a review of the yarn here - so you could always use this as an excuse to fondle the yarn and try out a few different colours. If you have a preference for which should be the 'correct' one, please leave a comment! *Affilliate/Sponsor info: Yarn for this project was supplied by Scheepjes, it can be purchased from Deramores and Wool Warehouse in the UK and from other international stockists. Please forgive my ignorance as I am only just learning to knit, but it is that one is wider than the other? I am much better at crochet but knitting is still a form of magic to me! They are lovely, and the colours you have used compliment each other perfectly. Hopefully one day I will be good enough to tackle the pattern! I am hoping to join in with the 'Last Dance on the Beach CAL', it is a beautiful tribute for such an inspiring and enigmatic personality. Hi Emma. So glad you feel the CAL is the perfect tribute for Wink. I wish she could see how many people she inspired and who still think of her. 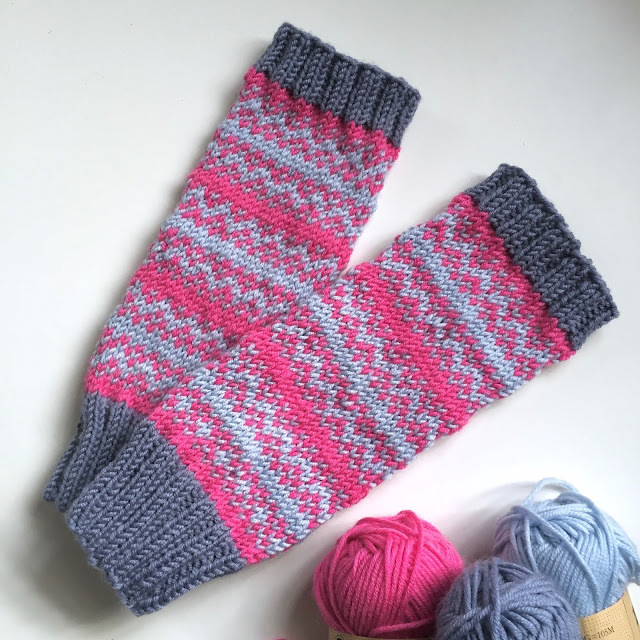 I won't give away my mistake(s) for the moment - let's see whether others can spot what happened first - but I'm so glad you like them and with a pattern to follow, they are easy enough for a new knitter to try colourwork, as long as you can knit in the round. I have been knitting for 40+ years and don't see it! There are places where the zig zag on the one on the right looks not to be the same angle as the one on the left, but it is probably just the angle of the photograph. Beautiful colors and work! I feel like I'm doing one of those "can you find the panda/goat/egg" pictures that are going round FB at the moment! I think a row is missing before each pinkish band but it has taken me about 15 minutes so I'm thinking you should not give this another thought! The colours are gorgeous and the pattern is super cute. "Mistake, what mistake"